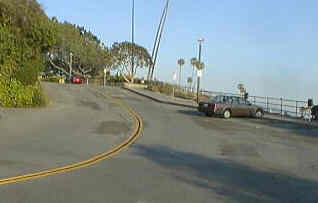 To get to Fisherman's Cove in Laguna Beach turn south at the traffic light on Beverly street from PCH. The signal has a sign for Beverly street, but when you turn south you are going onto Cliff Drive. The road forks immediately on Cliff drive, stay to the left going onto Cliff Drive and go about 200 yards. The staircase to Fisherman's Cove is just before the last apartment building (looking south, towards the beach). You will see a metal railing between the apartments and the grassy area for Heisler Park. 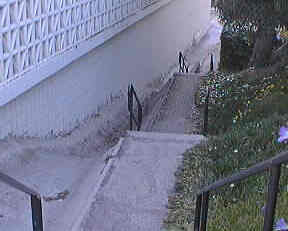 The steps to the cove are just past (or before, depending on where you parked) the entrance to Divers cove right next to the apartment building. The parking is available at Fisherman's Cove on a first come first serve basis. By the apartments the parking is private, please don't park in someone's driveway (No matter how tempting it looks). Towards Heisler park there is parking on both sides of the street. There ARE parking meters to pay (25 cents for each 15 minutes). Be sure to feed the meter well before you start your dive, WILL get a ticket if you do not! Please remember that this is a private residential area. Be very courteous to the neighborhood, quiet and discreet. Beach access is available from a stairway at the street level down to the shoreline. There is an apartment building on the left, and a view of Divers cove beach and Heisler park are the left. The stairs take you through a private residential area down to the beach (be very courteous!). The path winds around to the beach on the left. During high tide the entire beach gets wet so don't leave anything in the sand (it may not be there when you get back!). 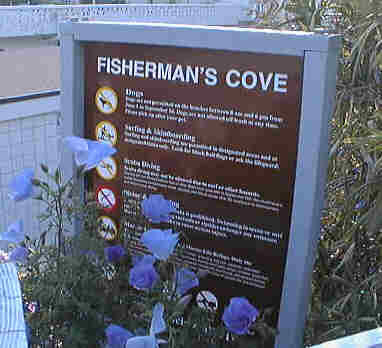 There are Facilities available at Fisherman's Cove by way of Heisler Park (Picnic Beach). If you follow the sidewalk from the top of the stairs and turn into the park. 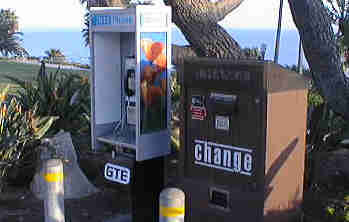 The picture shows one of the many pay telephones and the change machine (these are both a little way down the sidewalk, but they are there). There are drinking fountains, grills, tables, grassy areas, telephone and a change machine at the park. Diving at Fisherman's Cove is on the reef straight out. If you head to the left you get to the reef area of Divers cove. If you head to the right you get to the reef area of Shaws cove. The depth is typically about 18 to 30 feet. The reef straight out has several rock reef areas that are great to explore. 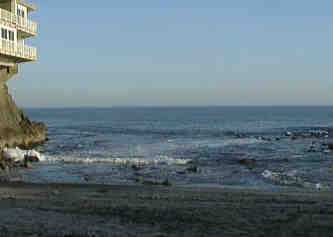 This area is a marine preserve and there is no hunting or gathering allowed! This area has always been good for seeing octopus, lobster, and small crabs. Marine life is abundant and most are rather small.